Luke Scott, son of Ridley, makes his directorial debut with Morgan, and you can definitely see his father’s influence all over his first foray into feature filmmaking. Like some of the better films Sir Ridley has made, it introduces an intriguing set-up, establishes a nicely suspenseful atmosphere, and adopts a slower pace to try and build it all up to a shocking and thrilling conclusion. The only thing it doesn’t do, however, is actually deliver on that conclusion, and as a result the film is an extremely unbalanced, but competently made, sci-fi thriller that has interesting ideas but never fully explores them. The set-up is that a group of scientists in a remote facility have been raising a genetically-altered young girl named Morgan (Anya Taylor-Joy), who was created in a lab with high intelligence and super-human abilities. However, when an incident forces her to stay within her cell, she violently attacks one of the scientists (Jennifer Jason Leigh), and so a corporate trouble-shooter named Lee Weathers (Kate Mara) is brought in to determine whether Morgan should be terminated as a result of her actions, which of course the specimen objects to quite a bit. In any other movie, Mara’s character would undoubtedly be the villain in this scenario with the scientists and even Morgan herself as the good guys. In fact, the film even starts off that way, as Lee is shown to be a cold, unsympathetic and even unlikable figure, the typical kind of snooty corporate hound brought in to shut the well-intentioned experiment down. Instead, she is effectively the lead, with everyone else relegated to supporting roles, but her consistent cold nature as well as a severe lack of any other personality outside of her darker aspects doesn’t make her an especially appealing protagonist. Most of the time, I actually ended up rooting more for the genetically-altered murderous creation than I was the person we’re meant to be following. Speaking of whom, Taylor-Joy – who you may remember from this year’s earlier horror standout The Witch, and soon to be seen in M. Night Shyamalan’s Split – is easily the best part of this movie, as the titular character whose childish looks are often outweighed by her creepy thousand-yard stare. There’s something about this actress, especially in this movie, that’s particularly unnerving in the best possible way, especially when she can still send shivers down your spine even when she’s draped in shadow. She’s probably the only character in the entire film who is completely rounded – after all, the film IS named after her – and the actress does a fantastic job at making even her most terrifying scenes seem like a walk in the park. She can also hold her own against other thespians on-screen, especially in one standout scene where she is being grilled by an arrogant psychologist played by Paul Giamatti, and it really says a lot about an actress’s abilities when she can be more scary than Giamatti’s shouting face without hardly saying a word. Everyone else in this rather starry cast, including Toby Jones, Rose Leslie, Michelle Yeoh, Jennifer Jason Leigh etc, is sadly wasted in roles that don’t require much out of them other than to either deliver clunky exposition (the common phrase “As you know…” pops into conversation at least once) or just serve as a mere obstacle for young Morgan to eventually obliterate in her path. It’s a shame, because I truly feel that there is definitely a better movie in there somewhere, one that if written a lot better could even compete with the likes of Ex Machina, a similar and far superior movie that this one is obviously trying to replicate with limited success. Unfortunately, Seth Owen’s script fails to find a right balance to explore this interesting concept to its full potential, with the action-heavy second half betraying the slower-paced and more thoughtful first half, and a film like this really needs to pick one and just have that be the consistent tone throughout the whole movie, instead of trying to cram all of it into one. It all ends with a twist that I’m honestly embarrassed I didn’t pick up on earlier in the film, given in retrospect how obvious and spelled-out it was, but it’s one that probably might be a step too far for some people, and for me it just asked a lot more questions that made me realise that perhaps it doesn’t make that much sense at all. To Luke Scott’s credit, however, he’s a fine director, and he can definitely craft suspense and tension where it’s needed; it just so happens that he’s been given a messy script to work with. He has worked on the last couple of films his father has made – Exodus: Gods and Kings, and The Martian – as a second unit director, so he definitely knows his stuff and it shows in some scenes that prove he can be a competent and talented filmmaker, but maybe not enough to save a flawed script like this one. I reckon that Luke Scott will probably go on to make much more solid films in the future, and that Morgan is just an early misstep that any debuting director is likely to experience at least once in their careers, but for now it’s the script to this one that kills the experiment, despite the efforts of all those trying to bring it to life. 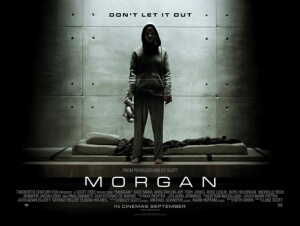 Morgan shows promise from debuting director Luke Scott, but it ultimately suffers from an unbalanced script that fails to fully explore its interesting ideas, and puts the wrong focus into a cold and unlikable lead when anyone else, perhaps even the titular character herself (winningly played by Anya Taylor-Joy), would have probably sufficed.